By default, ScreenSteps requires that a DSN be configured on every computer that connects to ScreenSteps Workgroup. To bypass this requirement, you can specify the Database Host where your SQL Server installation resides. By doing this, the admin tool will include this address in any connection files you export. When ScreenSteps Desktop attempts to connect to a Workgroup library it will first look for a DSN with the same name as the DSN specified in the connection file. 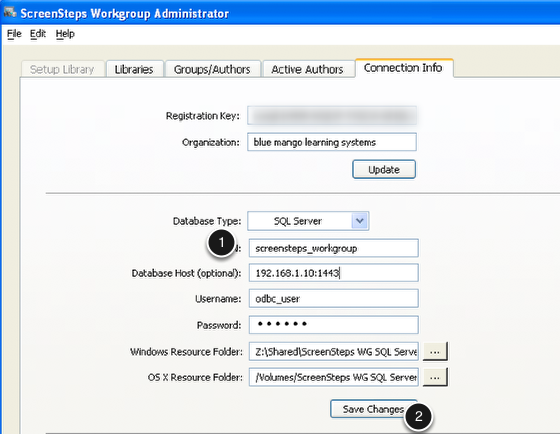 If no DSN is found by a Database Host has been configured then ScreenSteps Desktop will attempt to connect to the database using the host setting. This lesson will show you where to configure the Database Host. On the Connection Info tab you enter the Database Host (1). After entering a name click Save Changes.